The Weather Company (WSI) will integrate their weather data (collected from more than 100,000 sensors like cars, smartphones, and home weaterh stations)with IBM, after a new partnership announcement. The data will be integrated in a smart business applications to help companies around the world decrees losses due to weather activity and improve their performance. The collaboration will allow IBM and The Weather Company to build a new platform that allows them to take weather insights and bring them to new applications. It allows them to make an environment around the IBM Cloud, so the new classes of applications will be developed, with more access to that weather data and information. So when you think about the way people are developing new mobile applications today, IBM and The Weather Channel will provide a better way for developers to get access to the weather data to be directly integrated in their space. The Weather Company has data business division called WSI, with 30,000 companies licensing their data. The problem is that around 10% of their data I used and lot of the companies don’t have the knowledge on how to use the it. The Channel will rely on IBM to train thousands of consultants to help companies with embedding the data in their business models and build it in their decisions. The new analytics platform will help companies reduce cost and improve their business intelligence. The new analytics platform will help companies reduce cost and improve their business intelligence. On annual bases half a trillion dollars a year is effected by the weather and that is due to companies inability to prepare, inability to take the opportunity of been better prepared to react when weather is nicer and more favorable to retail and off sales – when the people are going to visit the car show room, when they are going to buy more supplies, how does the weather effect the thing I need to put in my retail store. IBM is giving example with insurance companies as one among many (energy & utilities, retail and logistics) that can benefit from the platform. They can use the data to change their offering and charge more based on weather forecasts and historical weather data. IBM and The Weather Company alliance will try to help enterprises across industries understand the impact of weather on their business and take action. Weather forecast shapes so many aspects of our lives. Its ripple effect impacts every corner of the economy. It leads to transportation delays, insurance claims, and problems with crop use, but it can also lead to sales. Weather is a huge variable for business performance and one of the largest big data challenges businesses face today. 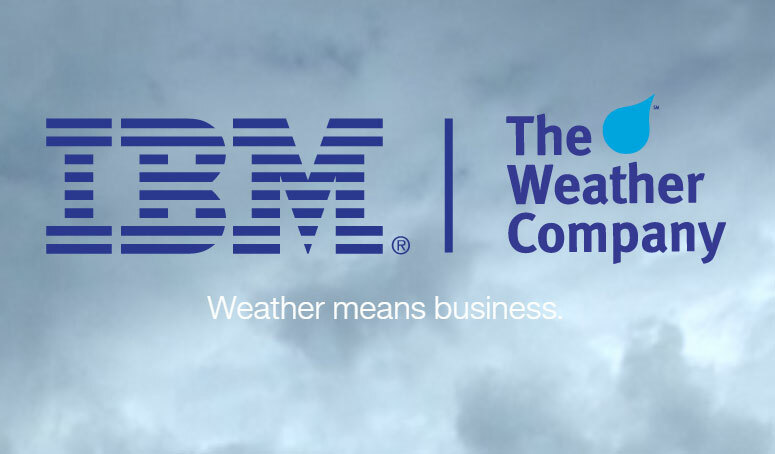 Now the Weather Company and IBM are partnering to help businesses take advantage of weathers ups and downs. With data from WSI on the Professional Division at the Weather Company and IBM’s analytics expertise in cloud computing businesses in every industry can make better decisions based on dating insight. And data inside is coming from everywhere across the Internet of Things in weather sensors smartphones cars and planes. Analyzing sales data and long-range forecasts can help retailers decide what to sell when and where. Insurers can now look at whether data plus policyholder data and warn customers before a storm to stay safe take steps to prevent property damage. Analyzing whether data that and energy consumption can help keep the lights on without wasting powered or dollars. The weather might be uncontrollable but businesses can control how they prepare and respond to weather patterns.